Build An Income, Travel The World And Live A Life More Exciting!You’re about to discover how to live life the way you've always wanted by building your very own side income so you can travel more, be more and do more.Do you crave a life that's more exciting? Do you want more time to follow your passions? Do you want to get more from your life with less? Do you want to live a life that's different to everyone else you know?This book helps teach you how to get the best out of your life by making extra money on the side, being able to travel the world on the cheap, to getting your 'weekly burn' down to maximizing cash flow and having a great life at home with less stress.The secret to having a much happier, fulfilling existence is that there is no secret. Everything that you need you already have, you just need to find it and work out how to put it into action. 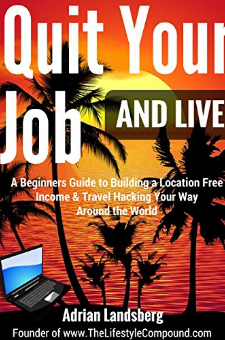 I want to help YOU find your inner awesome.If you want to improve your life in every way possible from building a side income to being able to travel the world with less than you spend at home now, then grab this book now!Get Your Free Course & Cheat Sheets With This Book!